Oct 30, 2017 | Reviewed by Happy daughter! Mom has been a resident of the Windsor for only a short time, but we are very impressed by this community. She has been in others before this, and they pale in comparison to the attention, care and activity she receives here. Overall, we couldn't be happier with our choice! The rooms at The Windsor at San Pablo were small. The place was nice, but I didn't think it was as good as the other community I visited. It was OK, but it wasn't for me. Positive and extremely engaging atmosphere with well furnished landscape. Living accommodations are very small and offers very little space for the residents. The interior is renovated and well furnished. The menu options were accommodating to special dietary needs. They had a variety of appetizing meals. Different activities within the facility have a designated room. The management is very responsive to the concerns of the residents and their families. The best way to get to know a community is by scheduling a tour. 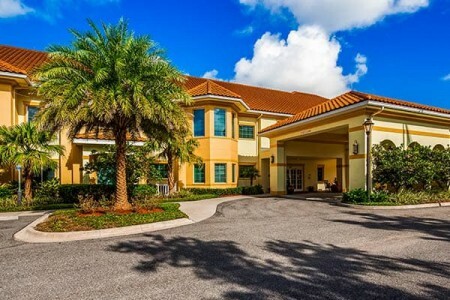 See the facilities, meet the staff and residents, and get a feel first hand what it's like to live at The Windsor at San Pablo Assisted Living. Imagine joining a senior community that puts the needs of residents first, and not those of shareholders or a corporate board. Imagine a community that has a beautiful campus in Jacksonville and a schedule full of invigorating activities, but still offers top-of-the-line safety features in every aspect. Now, stop imaging and come see the reality that we offer at The Windsor at San Pablo. The Windsor at San Pablo is one of many senior living communities owned and operated by Legend Senior Living. Legend was founded on values of servanthood, caring and character, and we carry that over to each of our communities. Every day, we strive to meet the physical, mental and spiritual needs of each of our residents. Our community is all about giving residents choices, and that begins with their apartment home. No matter which floorplan is chosen, residents will find their new home to be comfortable and spacious. The choices continue with our activity schedule, which includes games, fitness activities and other social get-togethers that promote new friendships and the overall well-being of each resident. Perhaps no time better exemplifies the choices offered at The Windsor at San Pablo than our Gold Leaf Dining program. Each day, residents gather for restaurant-quality meals, served off a variety of menus and taking into account special dietary needs. We even serve meals on linen tablecloths and with crystal glassware, bringing the dining experience to another level. site 24 hours a day, handle the laundry and housekeeping, giving our residents fewer chores to worry about and more time to enjoy life as independently as possible. And when a new resident joins The Windsor at San Pablo, we take the time to develop an individual care plan that takes every need into account. No two residents are alike, so neither should two care plans be identical. And when you only get the services you truly need, you won't have to pay for additional (and unnecessary) services, keeping your care level high and your costs low. When looking for a senior living community that offers fun, safety, personal growth and that won't break the bank, look no further than The Windsor at San Pablo.